Born and raised in sunny southern California by immigrant parents from Santiago, Chile. I have 3 older siblings, all of whom were born in Chile. My two oldest siblings are married, but my brother is the only one who has a child at the moment. My niece Julianna has become such a huge blessing in my life. I love her with all my heart. She is almost two years old at the moment, and it has been amazing to see how much she changes and grows from week to week. Plus, I’m her favorite aunt. She’s clung to me pretty much from day one. It melts my heart. 🙂 I now also have a nephew and another niece, Antonio & Layla! Antonio was born in January 2009 and Layla the following March. They are adorable and two of the cutest babies I know and I very much enjoy watching them and playing with them. I was also raised in a very musical and artistic family. All of my siblings and I began by playing the piano and went on to learn at least one other instrument, although I’m the only one that has made it a career choice. I started playing at the age of four, but I was soon begging for the chance to play the violin. I was finally allowed to start taking lessons at the age of 9. The rest is history. 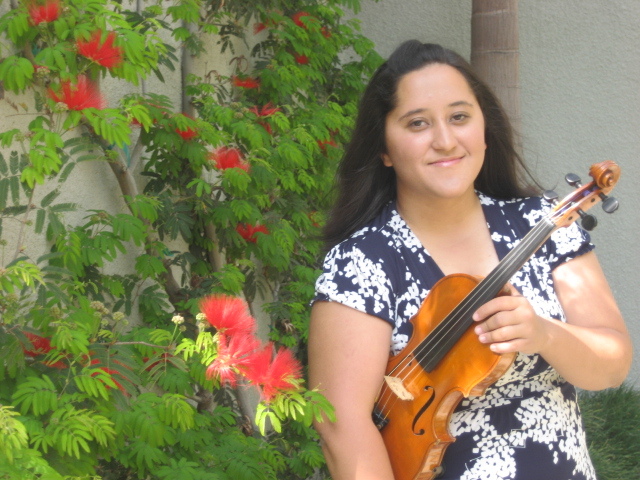 In December 2008, I received my Bachelor of Music in Violin Performance from Azusa Pacific University. It is a pleasure to be an alumna of APU. God only knows where my life will end up, but hopefully I will be able to put my degree into good use. For right now, I’ll be job searching and saving up some money for a while. Then who knows…probably grad school . That’s it for now, so please, enjoy the rest of my blog, leave comments, and check back soon for more updates!